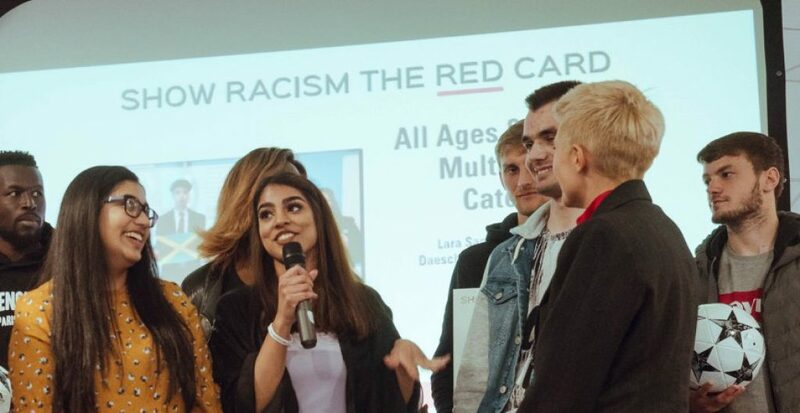 On Tuesday 24th April, Show Racism the Red Card held their Annual Awards Ceremony for the winners of the School Competition. The event took place at the bet365 stadium, home of Stoke City Football Club. Young people from all over the country attended the event to receive recognition, and prizes, for the fantastic artwork, creative writing and multi-media entries that they had produced. Alongside Gibbons and Smith, Stoke City manager, Paul Lambert, and 1st team player, Mame Biram Diouf also attended the event to present the prizes to the young people. The competition saw young people from schools throughout England create their own anti-racism messages in a variety of formats and is the largest equalities-themed competition for young people in the country. The competition was divided into 8 categories featuring artwork, creative writing and multi-media amongst others.